Folks, this is a war! 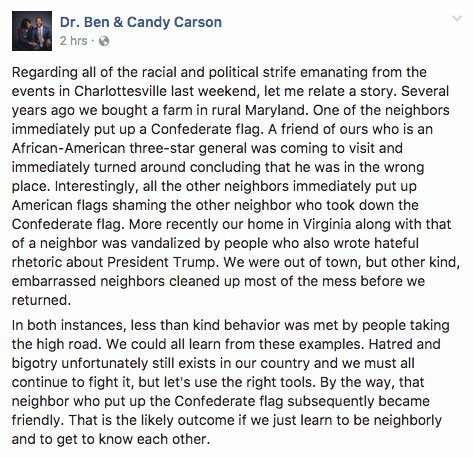 Ben Carson says in a statement that his home in Virginia was recently vandalized with anti-Trump rhetoric. Regarding all of the racial and political strife emanating from the events in Charlottesville last weekend, let me relate a story. Several years ago we bought a farm in rural Maryland. One of the neighbors immediately put up a Confederate flag. A friend of ours who is an African-American three-star general was coming to visit and immediately turned around concluding that he was in the wrong place. Interestingly, all the other neighbors immediately put up American flags shaming the other neighbor who took down the Confederate flag. More recently our home in Virginia along with that of a neighbor was vandalized by people who also wrote hateful rhetoric about President Trump. We were out of town, but other kind, embarrassed neighbors cleaned up most of the mess before we returned.